We will depart from Madrid to visit the birthplace of Miguel de Cervantes, as well as the house where he was born and the most emblematic places and monuments of the city of Alcalá de Henares, a World Heritage City. Its University, created around 1499, was one of the most prestigious in Europe in the Modern Age. After sightseeing we will taste the most typical dishes of Spain with live cooking and more than 20 references of gourmet products. 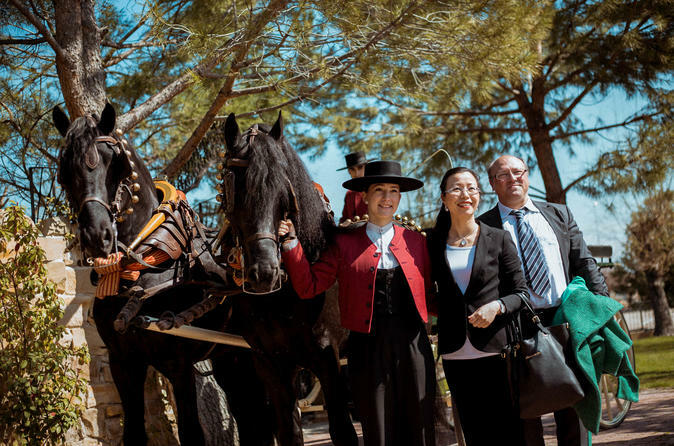 We will also enjoy a Flamenco show, equestrian show and ride in a horse-drawn carriage. Finally, our tour will end by visiting the exterior of the Real Madrid stadium or shopping in the most famous shopping center of Spain. Guaranteed by a company with more than 40 years of experience in the service sector. 9:00 Meeting at Plaza Cánovas del Castillo (Plaza Neptuno) and departure from Madrid. 10:00 Start of tour of Alcalá de Henares, World Heritage City and Miguel de Cervantes’ birthplace. 13:00-16:00 Show-cooking & Gastronomic gourmet tasting of paella, jamón, tortilla, wine, sangria and +20 typical references. 13:30 Horse-drawn carriage ride through ancient gardens. 14:30 Equestrian show with dressage and dance. 15:30 Flamenco show with distinguished artists.